"Mr. Rowe was a man of peculiar public spirit and patriotism, and it is probable that he paid for the carving of the fish and all the expenses incident thereto, even those connected with its 'hanging up in the room where the House sit,' out of his own pocket. It seems proper that something more than a mere reference should be made to the person to whose fore-thought and patriotism we owe the placing in our halls of legislation of so significant a reminder of an industry once the greatest in Massachusetts. It has been said of him he was 'as true a friend to his country as any whose names have reached a greater renown.' John, son of Joseph and Mary Rowe, was born at Exeter, Devon, England, on Nov. 16, 1715. The date of his departure from England is as unknown as that of his advent in Boston. That it was in his early youth is evident, for it is known that in 1740 he was made a member of St. John's Lodge of Freemasons, the first body of that fraternity to be established in Boston, and the records show that he was then twenty- five years of age. That he took a deep and lasting interest in Masonry is shown by the fact that he was elected master of the lodge nine years later,. being the fifth Provincial Grand Master of Masons in the year 1768. He held the office until his death. He made numerous investments in and about Boston, where he became the owner of considerable property, including the present Rowe's wharf, a residence on Pond, now Bedford, Street, and an estate in Milton. Chauncy Street for many years bore his name. From the very beginning John Rowe was an active and earnest participant in the struggle of the colonists to free themselves from the tyrannies of the mother country. He was one of the fifty most prominent and influential merchants and business men of Boston who, on Dec. 19, 1760, signed a petition to the General Court charging the officers of the Crown with appropriating to their own use money belonging to the Province. All through the agitation aroused by the odious stamp acts he was an indefatigable worker for the repeal of those iniquitous laws. So active was he in this direction that one historian has credited him with leading the mob against the house of Lieutenant Governor Hutchinson during the riots of 1765, caused by the enforcement of the stamp acts; although in justice to John Rowe it should be said that Hutchinson himself, in his account of this riot, states that the mob was led by one Mackintosh. John Rowe enjoyed in the highest degree the confidence and esteem of his fellow citizens, and was repeatedly appointed on committees in town meetings. In 1764 he was so appointed one of a committee of five to inform the Rev. Mr. George Whitefield of a unanimous vote of thanks for the great service rendered by the reverend gentleman in raising money to relieve the distress occasioned by the disastrous fire of 1760, which caused so much suffering to the people of Boston. If not a leader and moving spirit among the Sons of Liberty, he was at least in close sympathy with them and their aims, for on May 6, 1766, that organization controlled the election of the Representatives to the General Court from Boston, and chose James Otis, Thomas Cushing, Samuel Adams, John Hancock and John Rowe, the latter being selected upon the motion of Samuel Adams; and the distinguished company in which he found himself was of itself ample evidence of his ability and standing in the community. 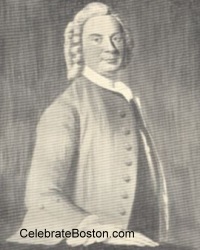 Nor was this the only public office held by him, for on March 14 of the following year we find him elected one of the selectmen, having for colleagues John Hancock, Samuel Sewall, William Phillips and others but little less renowned. He held this office until 1769, when he declined a re-election, and the board thereupon unanimously extended him a vote of thanks for his past services, At this time he was also one of the fire wards of the town. Although now past middle age, his interest in public questions was as keen as ever, and his patriotism as ardent as in the days of the stamp act excitement; and four years later, in 1773, at the age of fifty-eight, we find him, in conjunction with Samuel Adams and Hancock, a leading spirit in the stirring scenes that led up to the famous Boston Tea Party. It is claimed he was part owner in one of the vessels which brought to Boston the tea thrown into the harbor on the evening of Thursday, December 16; and from certain passages in his journal, covering the period from September, 1764, to July, 1779, it would seem the vessel was the 'Eleanor,' Captain Bruce. An entry in this journal, 'I would Rather have Lost five hundred Guineas than Captain Bruce should have taken any of this Tea on board his Ship,' indicates his annoyance that his vessel should have been implicated in this obnoxious proceeding; but self-interest did not deter him from doing all in his power to prevent the landing of the tea. The afternoon of Dec. 16, 1773, saw the Old South Church packed as it never had been before. At three o'clock it was estimated there were seven thousand people in and around the edifice. Samuel Adams, John Rowe, Young, Quincy and other distinguished citizens were upon the platform, exhorting the people to stand firm, and cautioning them to moderation. In the course of his address Rowe said, "Who knows how tea will mingle with salt water" — a suggestion which was received with loud applause, and has been thought by many to be a foreshadowing of what was to take place if permission was not given the vessels to sail without landing their obnoxious cargo. Rowe and Hancock have been accredited with taking part in throwing the tea overboard; but it is almost certain the former had no actual hand in so doing, for he was still upon the platform when, a little after six o'clock, the Mohawks rushed by the church on their way to Griffin's wharf, where the ships were moored. In 1743 John Rowe married Hannah Speakman in Boston. He was of a deeply religious turn of mind, and for many years was a member of the old Trinity Church, of which he was a warden from 1769 until 1777, and upon his death, Feb. 21,1787, he was buried under the church." The Sacred Cod was originally placed in the Hall of Representatives in the Old State House in 1784, and moved to the new State House in 1798.